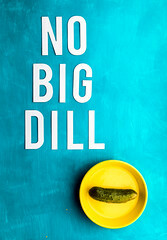 When I started this post, it didn’t look anything like it does now. It usually takes me several days to work through a post, from first draft to complete rewrites to editing, editing, and more editing. And when your writing time is carved out of stolen moments (sleeping baby? quick! type!) and fraught with interruptions (“cookie pweeze. COOKIE pweeze. COOKIEEEEE!! !”), it can take a very long time indeed. Which is why a tool like Zemanta, which promised to take care of some of the niggly details – like finding relevant pictures and links for me while I focus on content – looked so very promising. 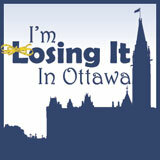 It is also why, when I installed it and my next Losing It in Ottawa post suddenly disappeared, it was very, very frustrating. Kick-and-scream-and-cry frustrating. Days worth of stolen moments, gone. And on a post with a deadline. As is my wont, from time to time (ok, pretty frequently), I vented on Twitter. I didn’t send my tweet to Zemanta, but they noticed it anyhow. And replied. Impressive, no? I had to do a double take. Surely I must have mis-read their comment. Surely they were saying something about their next version, not mine. Seriously Zemanta? A chuck on the shoulder and a “you’ll do better next time”? No mea culpa, no link to where I could report a bug, no placatory freebie? I didn’t expect a freebie. I didn’t expect anything. I sure as hell didn’t expect this. 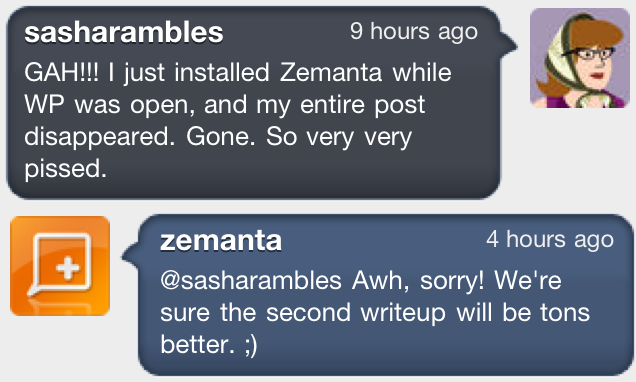 My first impression of Zemanta was really rather positive. It installed easily. It was free. I could see that it was going to save me time with the finishing touches. But rule number 1 in software development: do not lose the user’s data! Rule number 2: if you do, don’t try to tell them you did them a favour.